This much is fact: On October 7th, 1849, Edgar Allan Poe died under strange circumstances, and the exact cause of his demise remains unknown to this day. Given the writer's penchant for tales of horror and mystery, a work of dark fiction that would endeavor to tell just what happened during Poe's final days would seem ripe with potential. THE RAVEN attempts to do just that, casting John Cusack as Poe and pitting against a madman who is re-enacting the crimes from his stories in the days leading up to the doomed author's final “nevermore”. The Poe we meet is a sad creature, indeed. He's bitter over his lack of recognition and inability to make a decent living, still mourning the loss of his wife Virginia from consumption, and hopelessly in love with Emily (Alice Eve) despite the fact that her father Captain Hamilton (Brendan Gleeson) would sooner see Poe dead than have him marry his daughter. When a mother and daughter are murdered in a room from which there is seemingly no way the murderer could escape, Detective Fields (Luke Evans) recognizes the similarity to one of Poe's tales, and calls the writer in to assist with his investigation. Although Poe and the Detective are at first adversarial, once the killer kidnaps Emily the two men put their differences aside to try and save her. The script by Ben Livingston and Hannah Shakespeare has no shortage of issues, but I think the real problem here is director James McTeigue. While McTeigue has proven himself a capable director of action films with V FOR VENDETTA and the cheesy but fun NINJA ASSASSIN, his approach seems to run wholly counter to this material. On paper, THE RAVEN is a period horror/suspense film, but McTeigue directs it like a runaway train. 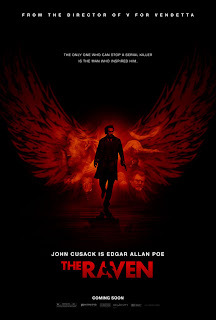 Everything is turned up to eleven, with Cusack's Poe in particular so over the top from the beginning that he hardly registers as being any more frazzled when the pressure really starts to mount. The basic premise is compelling, but the film seems to do everything in its power to sabotage itself. Poe's love for Emily should be the heart, soul, and driving force here, but McTiegue seems completely disinterested in pausing for even a second to give their romance the emotional resonance it needs. As for the mystery plot, when we finally get to the revelation of the killer's identity it's more “who cares” than “whodunnit”. Murky cinematography, impatient editing, and a blaring orchestral score certainly don't help things. About the only bright spot is Gleeson's typically solid supporting turn and, for the gorehounds in the audience, some delightfully gruesome murder scenes. 2 out of 4 stars.